Anke Weyer, Sun Shining Make Hay, 2017. Oil and acrylic on canvas, 198 x 168 cm. Courtesy Tim Van Laere Gallery, Antwerp. 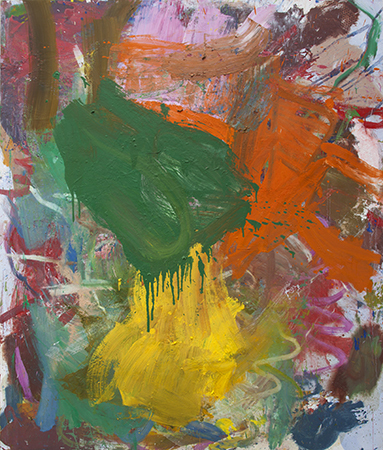 Tim Van Laere Gallery presents its first solo exhibition by German-American artist Anke Weyer (1974, Karlsruhe). Featuring the artist’s large-scale oil and acrylic paintings, the exhibition will also include a series of pastel drawings. Dismantling false dichotomies such as abstraction versus figuration, accident versus intention and confusion versus order, Anke Weyer has developed a practice where anything is possible, where confusion is as marvelous as it is treacherous. Uninhibited and instinctively Anke Weyer paints with a certain urgency, a speed that keeps the painted picture honest and pure. Speed triumphs over composition. Her compositional choices are made in the moment, very consciously or impulsive, each decision has a different meaning and magnitude. The paintings document Weyer’s proces: applying layers of paint, taking paint off, overpainting it again. Using energetic brush marks, drips, wipes and scrubbing, she develops a flux of forms and lines. She also proves herself to be a sublime colorist, using vivid colours that vibrate off the canvas. These strong bright colours appear more urgent and willing to represent an impulse. What matters most is what Anke Weyer allows within her process. What can remain visible and what needs to be scraped off or covered up. Her physical act of painting makes the works very personal and revealing. Showing fragments, mutations and mistakes that touch human nature in its most honest form. The titles are ambiguous, not intended to describe the meaning. They are words, sentences or abbreviations with their own meanings taken out of their original context. They accompany what is on the painting rather than explaining it. Leaving an open dialogue between the artwork and the viewer. The pastel drawings radiate the same energy as the paintings. The way Weyer applies vivid colours, firm lines and color blobs to paper can almost feel aggressive. Sweeping through the pastel with her fingers, leaving finger-, and even full handprints, one can really feel the presence of the artists through the drawings.